Most of us have at some time or another acted like klutzes when a friend or relative has had a life-threatening illness like cancer, particularly if that person is going through fairly grueling treatment for the condition. It’s difficult to know how to react and what to say. My advice is to try to put yourself into the cancer patient’s shoes and imagine how you would want to be treated if you were in his or her situation. I’ve had breast cancer twice, undergoing the memorable experience of chemo and radiation. I found many people, even total strangers, would bend over backwards to help me once they knew I was dealing with cancer. Some examples: I got my passport rushed through even though the photos I provided weren’t quite right. I’d shot them before doing chemo, so I was grateful not to have to get new ones showing my bald head. Then a booked-up plumber came over right away to fix a leaking toilet, giving me a discount on his fee. Later on, a phone company rep took it upon herself to give me a credit instead of a penalty when I blamed chemo brain fog for being late paying the bill. Nevertheless, I came across some stunningly dim responses from certain folks, most of whom were well-meaning. A now ex-friend of mine was one of only a small group of people whom I told about my second cancer diagnosis when I had just found out about it. Instead of offering me any help or sending words of encouragement, he blabbed about my condition to all our mutual acquaintances. The thoughtless fellow then began besieging me with emails about all kinds of things that supposedly might cause cancer. Why did he think I wanted to read those messages? That horse had already bolted—I already had cancer. Finally I had to tell him to stop sending me all that stuff. He and other clueless dolts, who will remain anonymous, inspired me to compile a long list of cancer etiquette do’s and don’ts to help friends, family and caregivers avoid inept behavior. 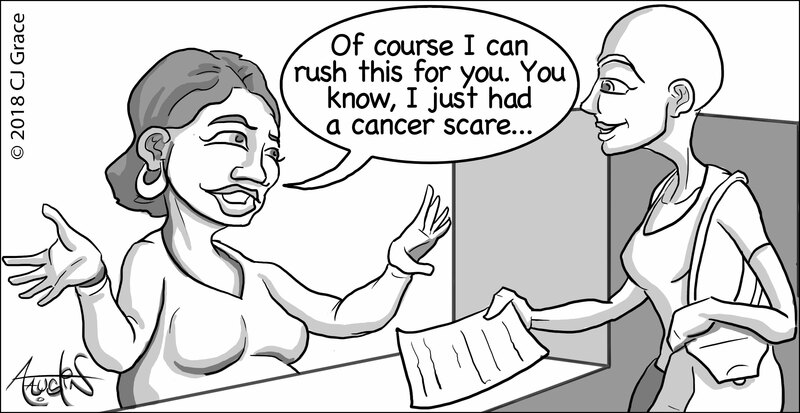 The biggest no-no: Telling the cancer patient that whatever treatment plan she or her doctors have chosen is completely wrong. Do not bombard a breast cancer patient with alternative cancer cures and/or therapists, emphasizing that your suggestions are the only way she’ll avoid a recurrence. Everybody and their mother’s uncle seem to have their own personal foolproof method for getting rid of the disease which they reckon that the poor, suffering cancer victim ignores at her peril. Don’t insist she’s making herself ill because she’s not thinking enough positive thoughts. Equally, do not ridicule her for any alternative treatment she chooses. If a Voodoo Witch Doctor is able to mitigate her pain, nausea and depression, do not make her feel bad about it, so long as the guy is not draining all her finances or getting himself written in as the beneficiary of her estate. For caregivers: Try to anticipate her needs rather than waiting for her to tell you. If you’re with her for long intervals, ask if you can bring over a meal or make one at her home. Offer to make her some tea or run a bath for her. For friends: Instead of saying, “Is there anything I can do?” offer tangible suggestions. Here are a few ideas on questions you could ask: Can I pick up your kids from school today? Can I do some babysitting? What shopping can I get for you? Would you like me to take your dog for a walk? Can I tidy your house? Can I do some gardening for you? Don’t be unnaturally cheerful and/or patronizingly pitying. She doesn’t want to hear you telling her at length how sorry you feel for her, especially if she hardly knows you. And finally…bring her European chocolates. I have to admit that, as a lifelong chocoholic from Britain, I’m biased about that. Just make sure you know if she prefers dark or milk. Dark is my favorite. During chemo, however, the 70% cacao chocolate I normally liked seemed too bitter but I still enjoyed the stuff that was 50%. Yes, I know sugar is said to be bad for cancer, but chocolate is good for the soul! CJ Grace was a BBC staff journalist in Britain and then worked for China Radio International in Beijing. The author of "Adulterer’s Wife: How to Thrive Whether You Stay or Not," she is currently completing "Hotel Chemo: Learning to Laugh through Breast Cancer and Infidelity." When CJ discovered her husband’s infidelity and then got breast cancer - for the second time - she refused to be a victim and kept her wicked sense of humor. After receiving a copy of "Adulterer’s Wife," Arianna Huffington invited CJ to write for HuffPost. CJ has an infidelity advice column on her website in association with DivorceForce.com. Her mantra: The best revenge is to get past the need for it. Visit adultererswife.com to find out more. Showcasing her BBC-trained British accent, CJ also has a voiceover business, rentabrit.com.